At AHN Biotechnologie we always seek to perfect our innovative products to ensure our customers experience the best craftsmanship and user experience. It is from this background that we are happy to introduce the AHN myTip® 200 µL gel loading tips. These tips are an addition to our ever-growing line of pipette tips which includes AHN myTip® Pipette Tips, AHN myTip® Filter Pipette Tips, AHN myTip® Low Retention Tips and AHN myTip® Low Retention Filter Tips. The AHN myTip® gel loading tips make the perfect companion for scientists working with protocols involving any kind of electrophoresis. Common use cases include horizontal agarose gel electrophoresis, 2-D protein analysis gel electrophoresis and SDS polyacrylamide gel electrophoresis (SDS-PAGE). We urge our clients to acquaint themselves with the documentation of the gel loading tips to ensure the best fit for their desired usage scenario. AHN myTip® 200 µL gel loading tips are constructed from premium-grade, autoclavable, non-wettable, non-leaching, virgin polypropylene. The clear material design of AHN myTip® gel loading tips allows researchers great visualisation of sample retrieval and gel loading. This gives more control to the scientist, enhancing their accuracy and precision during sample loading and offloading. 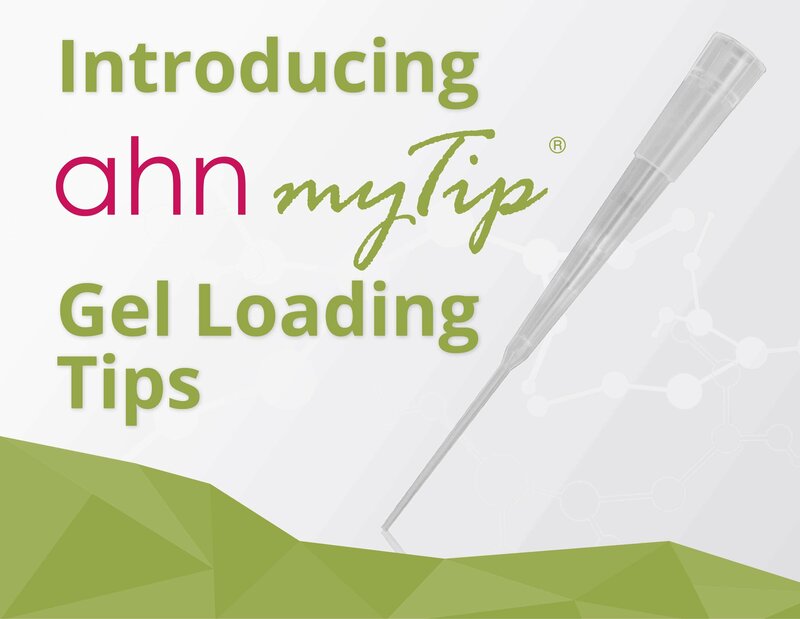 The current iteration of AHN myTip® gel loading tips accommodates a wide range of sample volumes varying from 0.1 – 200 µL. This allows researchers to work faster by using the same box of tips from the smallest (0.1 µL) to the largest (200 µL) sample volumes. All AHN myTip® 200 µL gel loading tips are manufactured in premium moulds that minimise sample volume disparities between tips, and the internal surface is highly polished to minimise liquid retention. With an optimal length of 68.5 mm users will find it easy to reach the bottom of most tubes and gel wells. This significantly reduces gel damage during loading allowing for great sample runs every time. The AHN myTip® 200 µL gel loading tips are designed to work best with AHN pipet4u® Pro single channel pipettes as well as AHN pipet4u® Revolution single channel electronic pipettes. The universal fit design of the AHN myTip® 200 µL gel loading tips ensures compatibility with most of the common research-grade pipettors from major brands. The universal fit design also ensures seamless tip loading and effortless tip ejection. AHN myTip® 200 µL gel loading tips are supplied in both sterile and non-sterile packaging options. Customers have the choice of acquiring the tips in conveniently packed 4 x 8 x 96 racks or budget-friendly 5 x 1000 bags. The high stability and minimal wobbling of the tip racks make for a comfortable tip loading experience. All tips, both sterile and non-sterile, are certified free of DNases, RNases, pyrogens, PCR inhibitors and human DNA in accordance with AHN Biotechnologie’s stringent quality control procedures. This ensures that our customers get the satisfaction they expect from using our products in creating a better world through scientific knowledge.